Pork and chicken seem to be the favoured non-seafood meat in both Spain and Portugal. Like their seafood, the quality is excellent and the price is low. Pork spare ribs are very popular, cheap and usually very meaty - we've cooked them several times on the Cobb with great success. Chickens are often corn fed, giving that lovely golden colour and extra flavour to the skin and flesh. Again, great on the Cobb, either pieces or the whole bird. In Portugal, it's very common to see whole chickens butterflied in the supermarkets, ready to grill as they do in the churasqueiras. Churasqueiras are a kind of barbecue/grill take-aways serving chicken, pork spare ribs and other meats and their popularity with the Portuguese is evident in the often long but fast moving queues outside. The optional piri-piri sauce for the chicken is a must for chilli lovers. Corn fed chicken pieces with mushrooms. To our delight, chillies are available in abundance in Spain and Portugal. We found green chillies called Pimientos de Padron in huge quantities in Spain (also available in smaller quantities in Portugal) - they're about 5cm long and generally not hot, although there is allegedly a Galician tradition to catch out the unwary of adding one very hot one to a plate of them in a restaurant. We bought them in 400g bags and used them to add crunch to salads and anything we could pop them into! Helen from Dakini passed on a simple recipe for an even better way to use them making a healthy and addictive nibble to have with a pre-dinner beer, G&T or glass of chilled rosé. Heat a bit of olive oil in a pan, fry the chillies until their skins start getting crispy and browned, toss in some mixed spices (Cajun spice, garam masala, chilli powder and cumin or anything you fancy!) and some salt, drain any excess oil and serve hot! 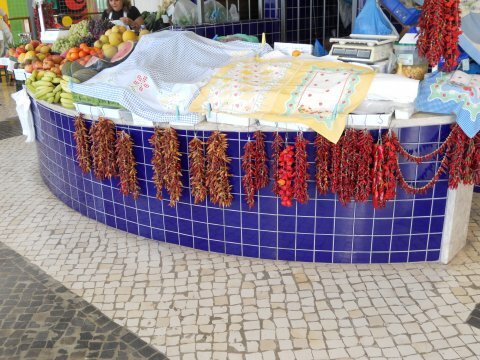 Very hot red chillies are the norm in Portugal, as is the fiery piri-piri sauce. Just looking at the beautiful chillies in the market has to bring a smile to your face! We obviously indulge in Spanish chorizo, which you all know and is widely available in the UK and elsewhere, but perhaps not often in quite the variety, including softer (but still cured) ones which work really well in casseroles, chopped or sliced into omelettes or scrambled egg (a great idea from my friend Silvio, who remembered it from his tour of Spain over 30 years ago). In Northern Spain (particularly in Asturias, the famous cider producing region) a popular and delicious tapas dish is chorizo cooked in cider. 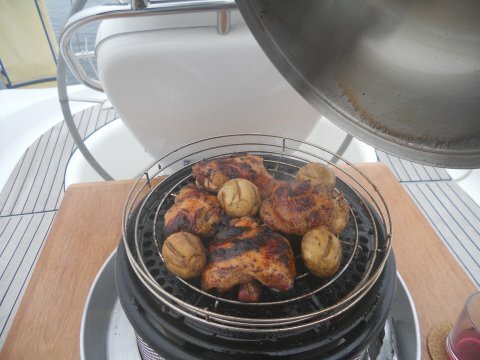 There are also chorizo sausages (uncooked) which we've cooked on the Cobb several times - nice but just mildly spicy sausages really and not as nice as some of the French Toulouse sausages we've eaten. Another spicy Spanish pork dish is zorza - chopped pork spiced with pimenton (paprika) and garlic. We tried this first as a tapas dish in Ribadeo and found it available in virtually every butchers or supermarket meat section. It comes in various grades of 'chop' from small chunks to julienne type slices, but cooks in a non-stick pan in a jiffy. Fry some finely sliced onions, garlic and red chillies (optional) first, turn the heat up, add the pork and fry until lightly browned and cooked through. Delicious with some salad in flour tortilla wraps, pita breads or over rice. Curiously, unlike most of the pre-seasoned meat you'd buy in UK supermarkets, even the supermarket bought zorza didn't seem to be full of water when we cooked it. Grilled fish is enormously popular in Portugal and particular favourites with the Portuguese are dorada (gilt-head bream) and sardines. Most traditional restaurants serve these, often cooked butterflied but without removing the bones or head. They really are delicious, quite cheap and particularly popular for lunch-time fare. Some restaurants have half a 44-gallon drum converted to a barbecue outside, and the smell of sardines grilling over coals in these is extremely enticing! We had some delicious and super crispy squid, very lightly battered and quickly fried, in a restaurant in A Pobra do Caraminal but haven't yet tried cooking it aboard - frying food in hot oil like that just isn't an option in our galley. We have cooked various types of clams and mussels, including razor clams. I think our favourite so far, apart from the obvious French style moules-frites, are clams cooked with onion, garlic, paprika (sometimes perked up with red chilli) and tomatoes (either tinned or fresh, skinned and chopped). We've cooked clams both on the stove below and in the frying dish on the Cobb. They work fine on the Cobb providing we allow sufficient time for the frying dish to really heat up before adding the clams. So, onto nightcaps and other liquid refreshments that we've discovered. The ubiquitous sangria in Spain can be bought pre-mixed in 1-litre plastic bottles either with or without gas (the fizzy one is surprisingly nice) or tetra packs, and although almost certainly not as nice as freshly made, is quite a refreshing summer evening drink, served with loads of ice and sliced oranges. Equally thirst-quenching and tasty is Tinto de Verano (also available pre-mixed); red wine, mixed roughly half and half or to taste, with lemonade or lemon fanta and served with loads of ice and a slice of lemon. These wine cocktails in Spain are allegedly so popular because they work with quite inexpensive wines as well as being very refreshing and less intoxicating when consumed in the heat of a Spanish summer! Another new drink we've tried, as suggested by one of the staff during our tour of Taylor's Port House, is white port and tonic, or Portonic as I discovered when I 'Googled' it. Using a white port (we bought a bottle of Taylor's Chip Dry), mix one part port with two parts tonic, serve as a long drink over ice with a wedge of lemon and a sprig of mint. A refreshing summer aperitif and alternative to gin & tonic.